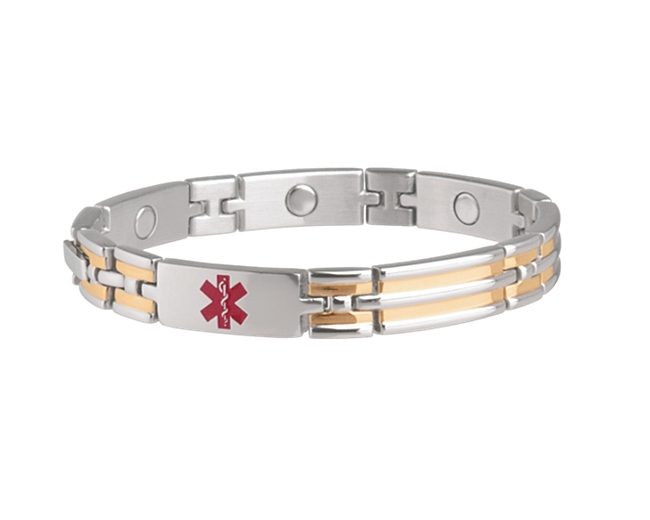 Unisex magnetic medical ID bracelet. 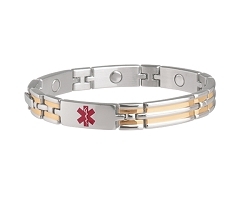 DIABETES - See Wallet Card is engraved on back on the inside of the bracelet, behind the medical alert symbol. This bracelet is perfect for casual wear or dress. The gold plating and polished stainless steel are a beautiful combination. The bracelet is approximately 5/16 inches wide. I love the bracelet and it serves a great purpose. I have had 2 of these and the red color for the medical insignia keeps coming off. Great seller !!!! Enjoyed doing business with. Item arrived just as described in great condition A+ seller. Awesome! Totally a Fantastic transaction! Would Highly Recommend! Item rec'vd OK, the small width looks more like a women's bracelet than a man's. Great product, very fast service!!!! Nice Items, Packs Them Good, Ships Real Fast Like Sellers Should! Item as described. Shipping was quick. Very happy customer. Thank you.